Homemade Roasted Peabutter (Toast Topper #44) | What Smells So Good? My school, like the majority of elementary institutions out there, is a strictly peanut free zone. Nothing that's processed can come into the common areas without a "nut-free" label slapped on the front of it, and even staff are strongly encouraged to avoid bringing nut products in their lunches or purses due to the risk of cross contamination. Not a problem... unless like a significant portion of school age children (and their parents) you love a good ol' PB&J sandwich at your midday meal. I'll admit, if I had to give up peanut butter entirely as a kid, I would not have been a happy camper, but at least I liked enough other brown-baggable foods to get through to highschool. A few of the children under my watch are so fussy, though, that without the invention of peanut-free butters like NoNuts Golden Peabutter and WOWbutter, they'd never eat at all. If you've never heard of either of these items, rest assured that neither of them is a strange chemical and gum product flavoured to resemble your longtime friend. WOWbutter is a "peanut butter replacement" made from roasted soybeans, while NoNuts is a similarly made item with roasted yellow peas. The major difference between the two is the one allergen they do contain. 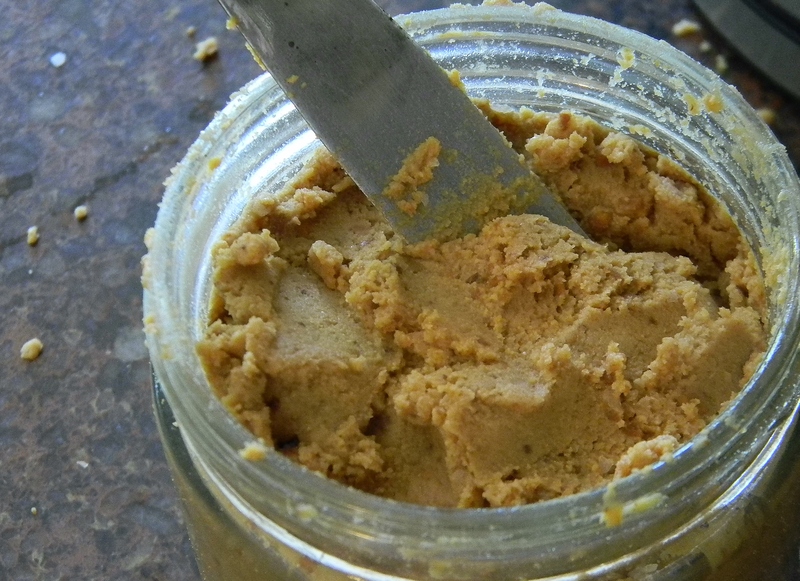 WOWbutter, obviously, contains a large amount of soy - adding to it's protein content but poses a danger to those with a soy sensitivity (something that can also happen to those with peanut reactions). Peabutter is soy-free, but the commercial variety sweetens it's product with cornstarch-containing icing sugar. Since I know both children and adults with allergies to both peanuts and one (or both) of these other major problem ingredients, I wanted to see if I could make my own. This way, I could not only have something to cook with at school in my classes, but I'd also have a recipe to give to the parents who are shelling out big time for the specialty products. It's a lot easier (and cheaper) to make peabutter at home than you may think, since all you need is an oven and a food processor or blender to get you going. Once you get the basic recipe down pat, the variations are as endless and delectable as you care to make them. Add a banana or your favourite jam to the mixture as it blends for an all-in-one healthy spread, try a few spoonfuls of Egg White Mallow Fluff for a mock fluffernutter, or pump up the decadence with homemade caramel or chocolate syrup. It's up to you! So, if you (or your kids) want the PB&J sandwiches - without any of the Top 9 allergens - give this recipe a whirl. It has all the delicious roasted flavour of the original, no weird stuff, less cost and even less fat and calories than your standard jarred spread. Place peas in a bowl and cover by at least 1" with cool water. Cover and let stand 24 hours. Drain the peas and spread in one layer on the sheet. Place in the oven and bake for 1 hour, shaking the pan every 15 minutes to prevent burning. When cool place roasted peas into a blender or food processor and add (measured) water. Let stand 15 minutes, then pulse to finely chop. Add oil, agave and salt and let the machine run until a smooth paste is reached, adding more water if necessary. Scrape into a jar and store in the fridge up to 2 weeks.